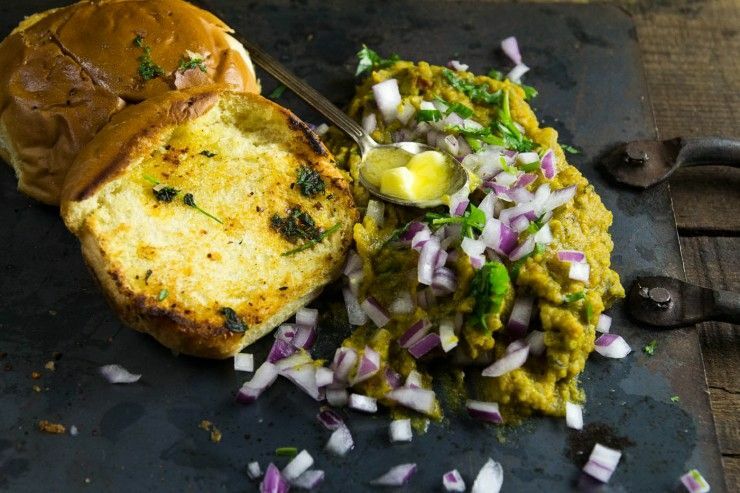 How to make authentic, street style pav bhaji at home. It's easy! One of the things I miss most about living in Mumbai is the pav bhaji. It was one of the foods I ate so regularly when I lived there. 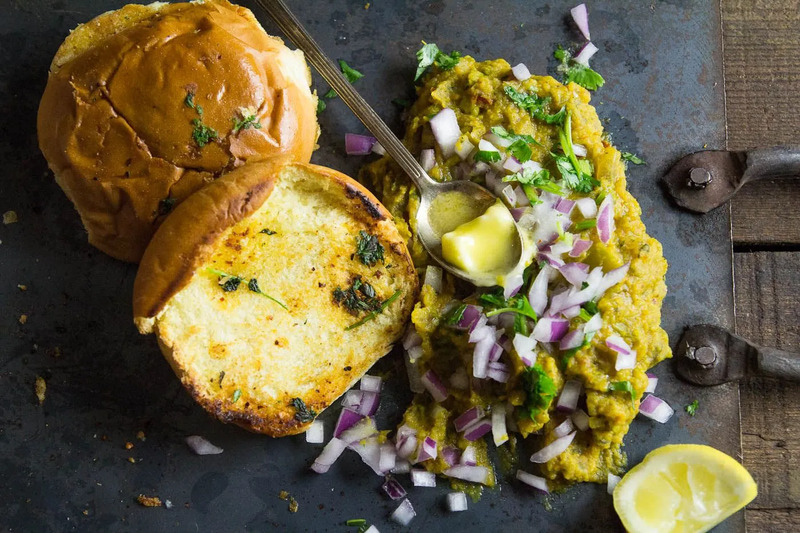 You can get great pav bhaji on the streets of Mumbai anytime you want. I know many people who make pav bhaji at home, and sadly, it never measures up. A few weeks ago, I was craving that delicious spicy and buttery flavor again and came across this amazing video. I’ve eaten at this exact place! And yes, their pav bhaji was amazing! 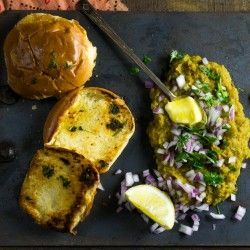 Not only does it bring back memories of growing up in Mumbai but it also helped me figure out how to go about creating a pav bhaji recipe. 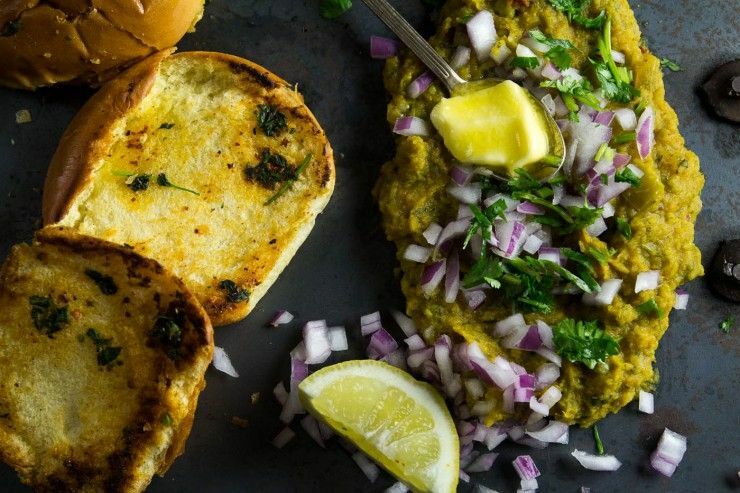 I have tried on may occasions to recreate this classic recipe and though the results have been good, they were far from the street pav bhaji of my memories. When I saw the video I knew I had to figure out how to make pav bhaji the way it is made on the streets of Mumbai. 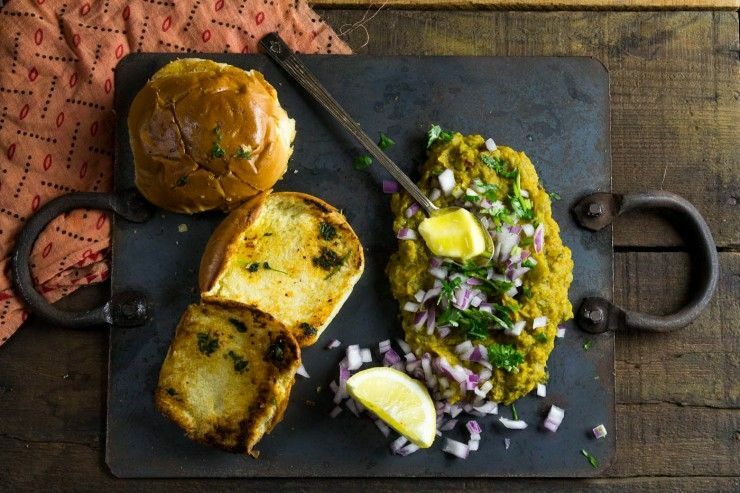 Pav Bhaji was invented in Mumbai in the 1850s. 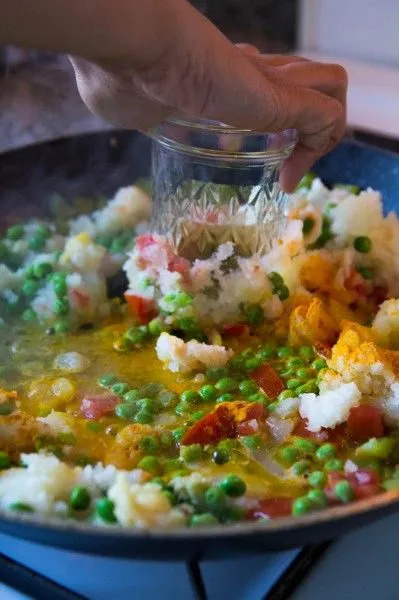 It is a spicy, buttery dish that reflects both the city’s multiculturalism and its fast paced lifestyle. It is the quintessential Mumbai meal. Street vendors invented it in the 1850s for the textile workers in the city who did not have much time for lunch and who also did not want to eat a heavy meal as working a physical job on an extra full stomach is not easy. An ingenious vendor came up with pav bhaji as the answer. The story of this dish deeply reflects the story of the city it was born in. Mumbai has been an international city probably ever since the Portuguese (the word, pao, means bread in Portuguese. It’s written “p-a-v” in Hindi but is pronounced the same way) originally colonized it in 1534. They later gave it away to England as part of the dowry for Catherine of Braganza on her marriage to Charles the second in 1661. Soon after this, the British crown transferred Mumbai to the British East India company because it wasn’t commercially successful. How ironic is that? Mumbai is now the financial capital of India and an international metropolis. Today, Mumbai is known as a super fast paced city. The people there don’t have time to stop for such conveniences as lunch. 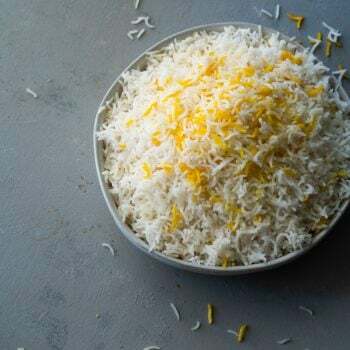 So it only makes sense that its quintessential dish would be one that is made for working hard and fast and for minimizing break-time. 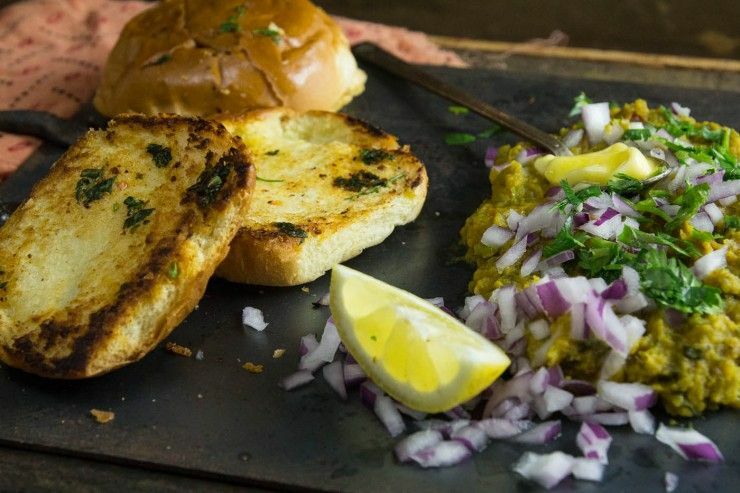 I used to eat Pav Bhaji a couple of times every week when I was home from school for summer vacations. We knew a vendor who would deliver it to our house. 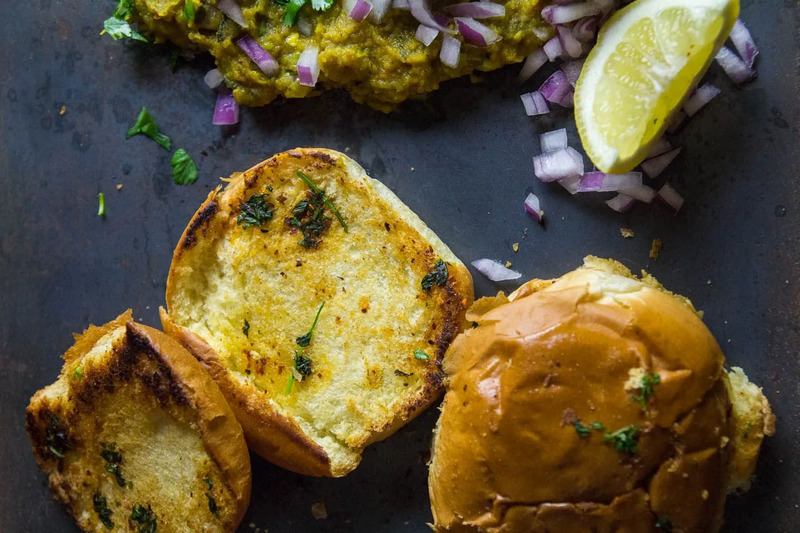 Opening the plastic bags and pouring the bhaji onto my plate, inhaling the steam coming off the plate as the smell and warmth of the spicy pav bhaji wafted into my nostrils was pure magic. 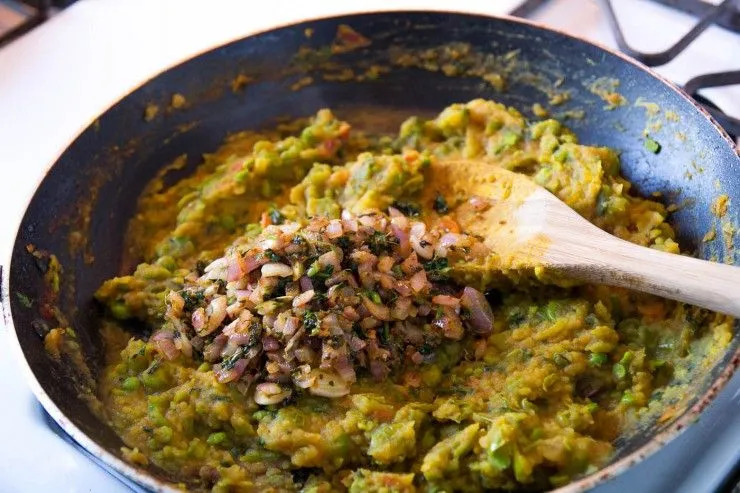 I would squeeze a little lemon over the bhaji and dig in. I picked up a few tips from the video I watched. There is no need for sauteing onions at the start. And trust me, it makes all the difference! I made this several times in the same week and think I’ve come up with a recipe that I can be proud of. 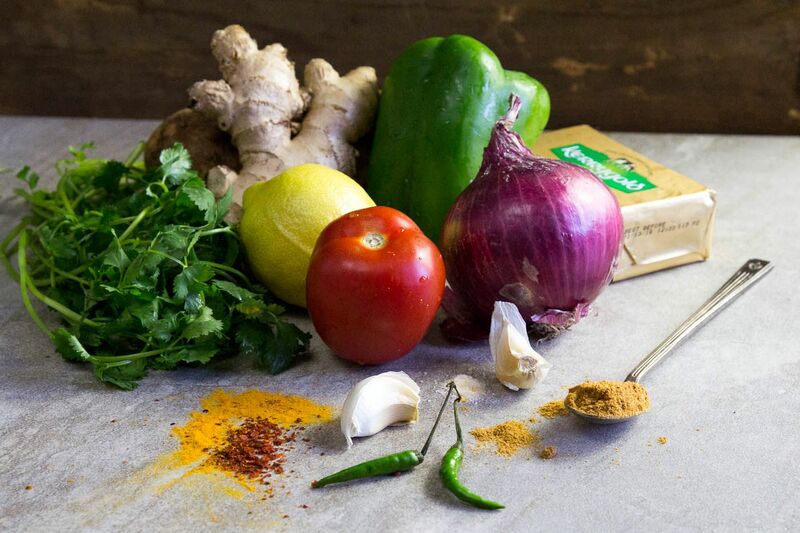 Because I wanted to be street authentic, I used a boxed masala just as the vendors would. Pav bhaji at home isn’t exactly the same as getting it from a street vendor in Bombay, but it definitely hits the spot! Heat a large shallow pan over medium high heat. When the pan is hot, add the bell pepped and a ¼ cup of water. Stir and cook until the bell pepper is soft, adding more water as necessary. Add the tomato, mashed potato, peas, ginger paste, garlic paste, turmeric, red chili powder, salt and ½ cup of water. 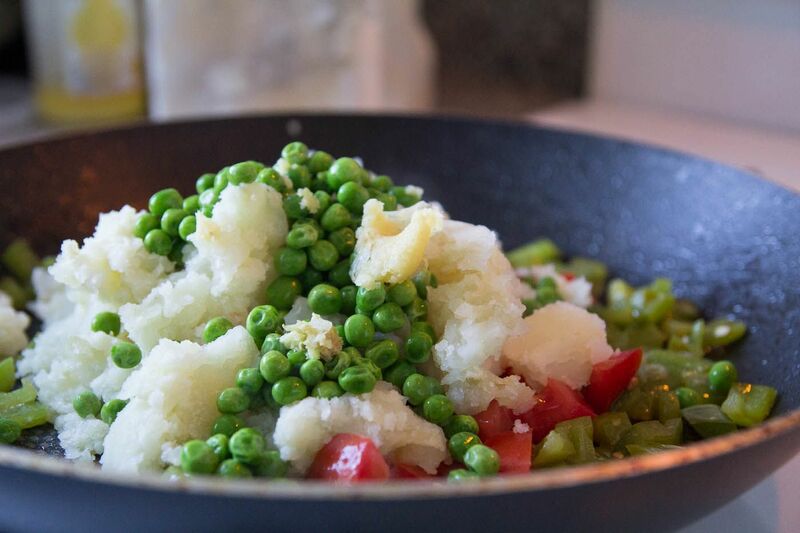 Mash all this together in the pan using a potato masher or the bottom of a glass. Mash and stir until everything is well combined, adding water as necessary to avoid burning. Add 2 tablespoons of butter and ¼ cup water and continue mashing and stirring until the mixture comes to a boil. In a smaller pan, heat 1 tablespoon of butter. When the butter starts to foam up, add the asafoetida and stir. 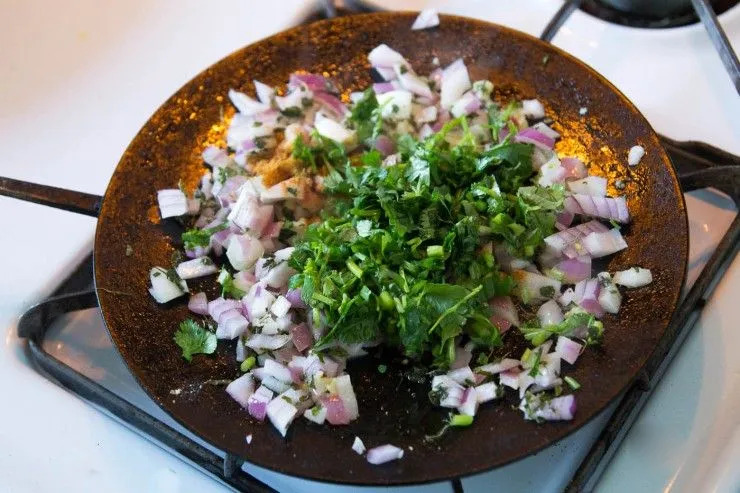 Add in about half the onions, the rest of the ginger and garlic paste, dried fenugreek leaves, 1 teaspoon pav bhaji masala, and a little cilantro. Stir and cook until the onions have softened. Add this onion mixture to the vegetable mash. Cook and stir for about 5 minutes. Wipe the pan that was used to cook the onions. 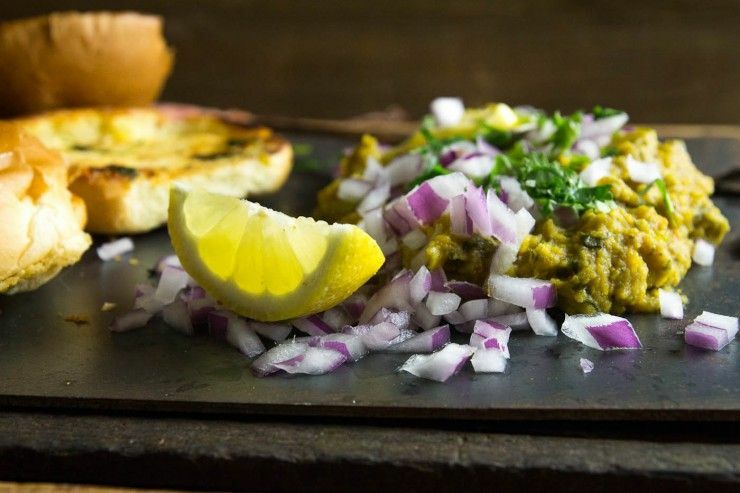 Heat a little butter on it, sprinkle some pav bhaji masala and cilantro. Drag the bread through the butter and let toast for about 30 seconds on each side. To serve sprinkle the vegetable mash with raw onions and cilantro. Add a pat of butter on top. 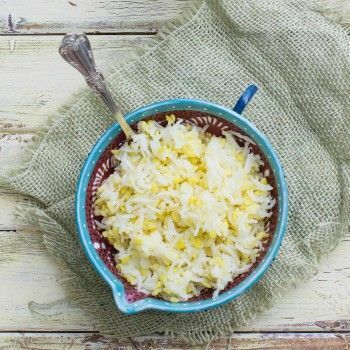 Serve warm with the buttered bread and a slice or lemon on the side. 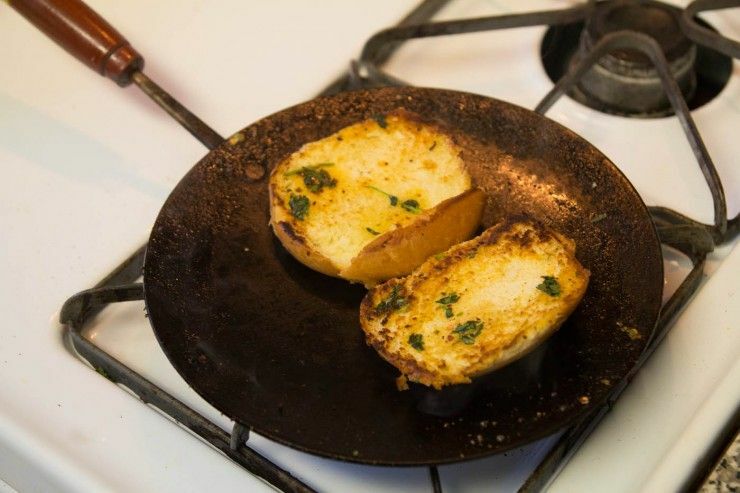 If you use a nonstick pan, add a tablespoon or oil before heating it. You can either throw out the oil once the pan is hot or just add the bell peppers and follow the rest of the steps. 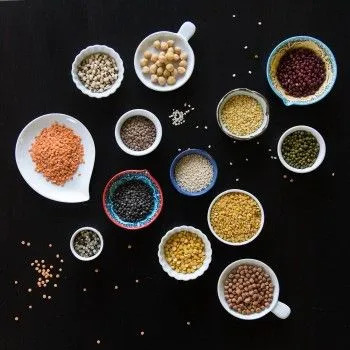 I adapted this recipe to work for a home cook. 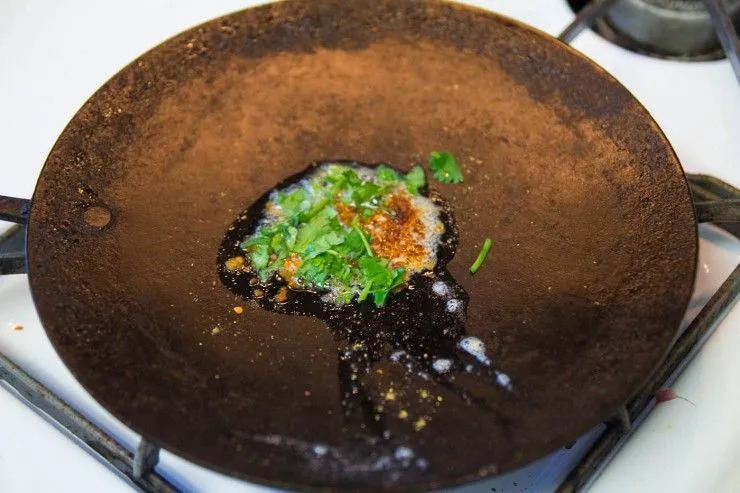 I don’t have a giant flat pan (tava) lying around the house and I expect you don’t either. I cooked this on my go-to 12 inch nonstick skillet, a cast iron skillet, and on a stainless steel saute pan. It worked well in each of them. I’m sure a paella pan would work well if you have one. Steve picked up a package of rolls simply labeled “dinner rolls” from our local grocery store. They were surprisingly similar to the pav available in India. 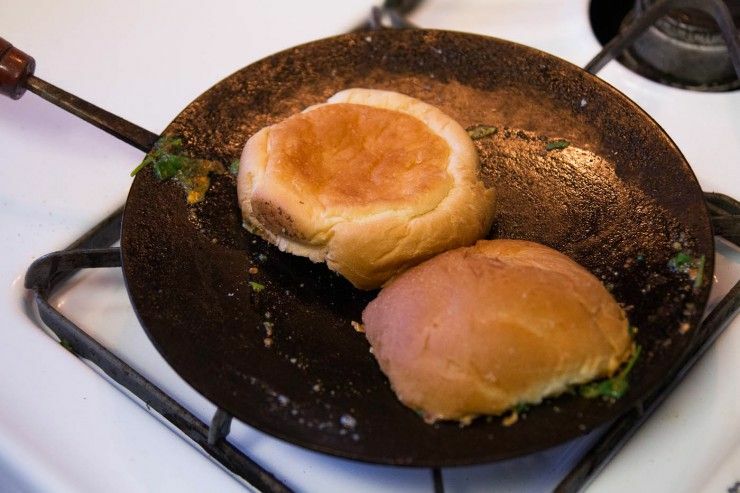 A lot of people use hamburger buns as well (but I’m not a fan because I find them too sweet). Comments on "Pav Bhaji, A Quintessential Bombay Street Food"
Thanks Snehal! I've made pav bhaji by boiling and mashing the vegetables beforehand too. It was never quite worked for me. Wow! Over here, it's close to 8a.m. and I get incredibly hungry looking at this wonderful recipe and pictures. Thanks so much for this and for your description of Mumbay - in combination with this recipe, it feels like as a reader you can hear and smell this surely exciting city :-). Just tried this recipe - sooo delicious :) Thank you! I have to say I found your blog while searching a few weeks ago and I quite enjoy it! Great work!